Seniors over the age of 65 have a high risk of breaking their hip. This is a traumatic injury that can really affect the health and well-being of even the healthiest senior. Hip fractures can only be treated via surgery, and the recovery is long and often difficult. Seniors must rely on family, friends, and elder care assistance to get through the recovery period for a broken hip. All in all, hip fractures are something that seniors should try to avoid. The good news is that there are several things that elderly adults and their family members can do to prevent the accidents that cause hip fractures as well as strengthen the body to better withstand an impact. Family caregivers need to make sure the elderly relative’s living space is clutter-free and safe for foot traffic. Things like loose rugs, slippery tile, clutter, and poor lighting can all cause an elderly person to have a slip and fall accident and break their hip. Caregivers should also make sure other family members, senior care aides and others also pay attention to the walkways of the living space. A healthy and strong elderly body is much less likely to fall and break a hip so family caregivers should help their aging relatives eat right and build muscle. It’s a good idea to consult with a physical therapist or occupational therapist for exercises that will strengthen the muscles and improve balance. Seniors should also avoid tobacco and alcohol, as that can contribute to bone density loss. Eye exams to ensure good vision can also make a difference in keeping seniors safe from slip and fall accidents. Seniors may take calcium and vitamin D supplements to build stronger bones, as advised by their doctor. For those that suffer with osteoporosis, there are additional medications that they can take. If the elderly adult seems to feel dizzy a lot, it’s worth talking to the doctor about what medications they are on and whether they may be causing dizziness. Seniors should avoid wearing footwear that doesn’t support their feet or that may cause them to slip. Non-skid soles on flexible shoes are the best bet to help the elderly stay on their feet. If they are unsteady or worry about falling, caregivers can talk to the doctor about using a cane or walker. They should avoid being outdoors in snowy or icy weather as well. 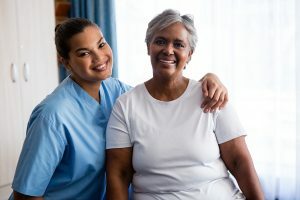 It’s not too late for family caregivers to work with their elderly relative to prevent a hip fracture and reduce the risk of a slip and fall accident. It’s important for family members, neighbors, elder care assistants and anyone else that is involved in the day to day care of an elderly adult to be on the same page when it comes to preventing a broken hip. If you or an aging loved one are considering elder care in Old Bridge Township, NJ, please contact the caring staff at Lares Home Care 888-492-3538 or 732-566-1112.